Japanese materials provider Toray Industries and Germany-based Kautex Maschinenbau are partnering in 3D blow moulding R&D. At Toray's technical centre in the factory in Nagoya, Kautex has provide an extrusion blow moulding machine type KBS20 to test the production of different 3D pipes using the suction blow process. The focus here lies on the development of especially heat-resistant air ducts made from polyphenylene sulphide (PPS). Jürgen Moitzheim, Sales Director at Kautex Maschinenbau, says, "The latest developments in combustion engines are once again creating challenges for automotive industry suppliers. This is especially true for the interplay between materials and engine technology. For this reason we like to work very closely together with our customers on the development of new solutions." A current development trend in the automotive industry is the downsizing of car engines while at the same time increasing performance. In order to achieve this, turbochargers are installed which need especially heat-resistant ducts. 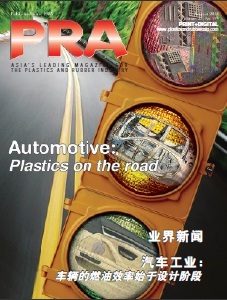 Toray says it achieved very good results with PPS. This plastic distinguishes itself with especially high and durable heat-resistance up to 220°C. Since 1999, it has been possible to produce 3D moulded parts on Kautex machine type KBS, which have numerous applications for pipes and tubes in the car industry. 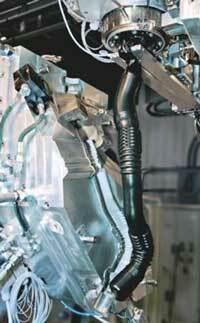 They are used as fuel filling pipes, intake air ducts, or cooling air ducts in modern combustion engines. 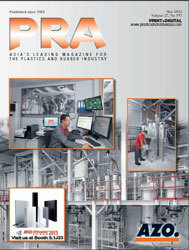 3D blow moulding is an especially low-waste production method. In contrast to the conventional method, the parisons are moulded into functional components without welds. Further advantages arise in the manufacture of 3D ducts when using the suction blow moulding method. Here, the parison is drawn into the elongated cavity of a blow mould before the actual blow moulding of the part. This allows the use of significantly simpler and consequently cheaper blow moulding tools.